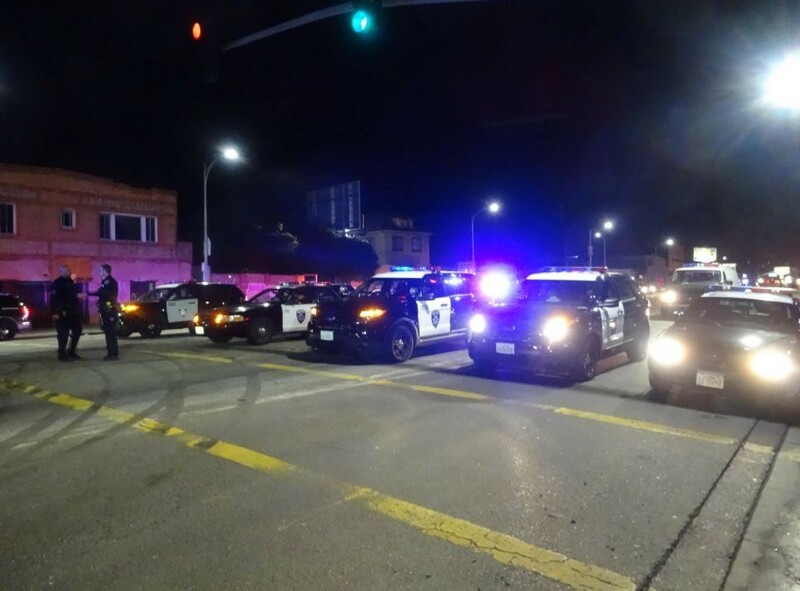 Oakland police blockade International Boulevard at 54th Avenue on Sunday night to disrupt a sideshow that involved 150 vehicles. Several massive sideshows took over Oakland's streets this weekend, and Oakland police officers shot and killed a man on Sunday evening at an East Oakland gas station. Details about the shooting and the sideshows are just beginning to emerge. At a press conference this morning, Oakland Police Chief Sean Whent said officers had "developed information" about a group of motorcyclists who planned to gather in the city on Sunday. Officers tracked the motorcyclists as they rode through city streets. Police eventually cornered some of the bikers at a gas station at 90th and Bancroft avenues. While attempting to confiscate motorcycles from the riders, four Oakland police officers fatally shot a 39 year-old man. But Whent said the man did not appear to be associated with the motorcyclists. Police produced a picture of a “replica” airsoft gun they said the man pointed in the direction of the officers before the shooting. Several people who said they witnessed the shooting told me they heard between ten and fifteen shots. 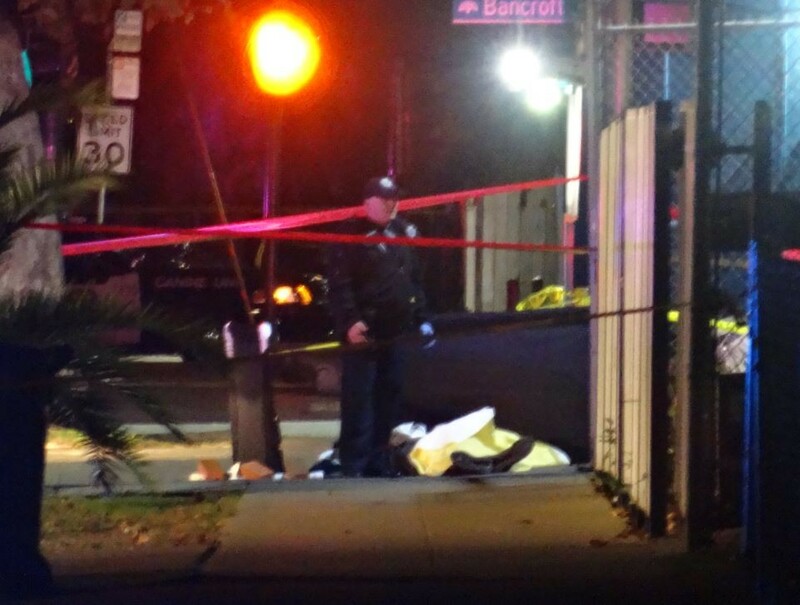 An Oakland police officer stands near the body of a man shot and killed by the police on Sunday night. Among the officers who shot the man were three rookies with between six and eighteen months on the force, along with a sergeant with seven years of experience. Whent said none of the officers had their body cameras activated, because they were in the process of writing police reports and impounding the vehicles. It’s unclear if there is any video of the shooting, but the gas station where it occurred has its own video surveillance system, and Whent said the police collected camera footage from businesses and houses in the area. The shooting sapped resources from OPD at the same moment a sideshow converged on International Boulevard and 54th Avenue. About 150 cars took over the intersection. Drivers cut donuts in the street and shots were fired, according to witnesses. The sideshow on Sunday night followed a takeover of Interstate 880 on Saturday night and early Sunday morning when about 700 cars stopped traffic to perform stunts. At one point, OPD officers retreated from the scene and participants in the sideshow climbed aboard an empty police car and stomped its hood and windows. Police said the sideshows included car clubs from Fresno and Los Angeles, and motorcyclists from San Jose. 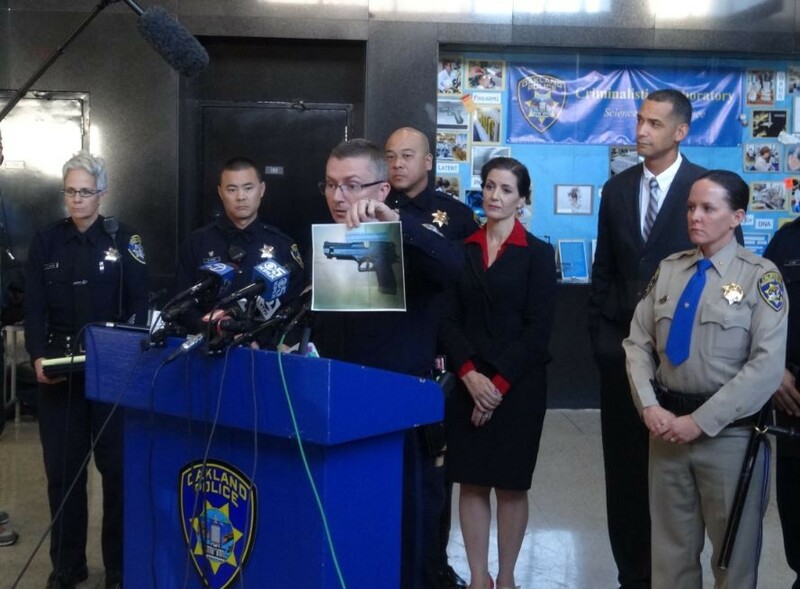 Oakland police chief Sean Whent displaying a photo of the "replica" gun allegedly brandished by a man who was shot and killed on Sunday. According to Schaaf and Whent, the California Highway Patrol has been coordinating with the Oakland Police Department for several months now to crack down on sideshows. A team of CHP officers has been helping OPD locate and break up the events, mostly on Saturday nights. Whent said it is difficult to break up sideshows. “Social media drives a lot of this,” said Whent about how the sideshows are organized. “So it doesn’t take a lot of advanced planning.” Whent said OPD is actively monitoring social media to gain intelligence on when and where car clubs and motorcyclists might gather in Oakland.